A panel of Australia's Market Masters have shared their top stock ideas at Livewire Live each year since inception. On average, the stocks have beaten the market by at least 25% each time. Just over a month since Livewire Live 2017, and this year’s stocks are already ahead by 3.1%. 2017 marks the third year of Livewire Live. This year the event featured 14 fund managers pitching their investment ideas to a sold out audience of 250 investors. The jewel in the crown of this event is the Australian equities panel hosted by Matthew Kidman, Principal of Centennial Asset Management. Each year three ‘Market Masters’ from the Australian Funds Management industry are invited to join the panel session focusing on their investment techniques and debating the current state of the markets. Each of the panellists also then nominates their top stock idea for the next 12 months. Here is their form to date. The 3 Masters of the Market from first Livewire Live in 2015 were up an average of 27.6% over the ensuing 12 months, with all 3 stocks well ahead of the ASX200, which was down slightly over the same period. That year, Ben Griffiths, Portfolio Manager at Eley Griffiths Group, picked Auckland International (AIA), which went on to gain +35.5%. Anton Tagliaferro, Investment Director at Investors Mutual notched up 27.8% with Steadfast Group (SDF), and Geoff Wilson, Chairman at Wilson Asset Management, was up 19.0% with Eclipx (ECX). The Masters of the Market at Livewire Live 2016 even outshone the result from the previous year, averaging a remarkable 36.4% in the 12 months after the event, versus 10.5% for the ASX200 over the same period. All three were in the black, with Geoff Wilson, Chairman at Wilson Asset Management nominating APO / NZME which was up by 31.76%. Ben Griffiths, in his second year on the panel, was up 7.5% with Aventus (AVN). Crispin Murray, Head of Equities at BT Investment Management, was well in the lead with a 70.5% gain from Qantas (QAN), a highly contrarian idea at the time. When he nominated the stock, Kidman quipped: “Is that a long or a short idea?” Murray replied: “The fact that you ask me that is part of the reason that we like it”. 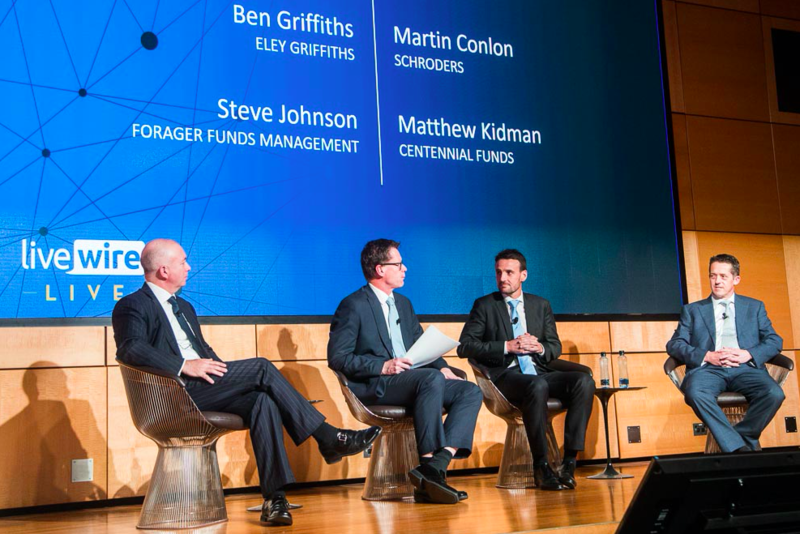 This year’s panel included Ben Griffiths for his third year running, Martin Conlon, Head of Australian Equities at Schroders, and Steve Johnson, CIO at Forager Funds. With just over a month since the event, and reporting season taking place in the interim, the picks are on average ahead of the market by 3.1%. There are no guarantees this will continue of course, but so far, the form from the Masters continues. Ben Griffiths had the option of putting two stock ideas forward, but relinquished one to focus exclusively on Platinum Asset Management (PTM). “We’re beginning to think that the variables that have impacted on the fortunes of Platinum Asset Management have stabilised, and in many cases improved”. He also highlighted the short position that had been building in the stock, which had grown from 2% to over 4% in the few months leading up to his presentation. With the share price jumping 5.5% since then, some shorts have already been forced to cover. Improving conditions for the stock may put further pressure on the remaining shorts. In terms of a stock idea, he went contrarian, picking Alumina Limited (AWC) which fell 85% in the GFC and has been range-bound near its lows ever since. He liked the value in the assets, and is taking a view on aluminium. “You’re still buying a portfolio of really good quality at well below replacement cost, at a time that China are likely to move out of the market as pollution becomes an issue. It’s been a really rotten decade for that commodity, but demand is pretty good”. 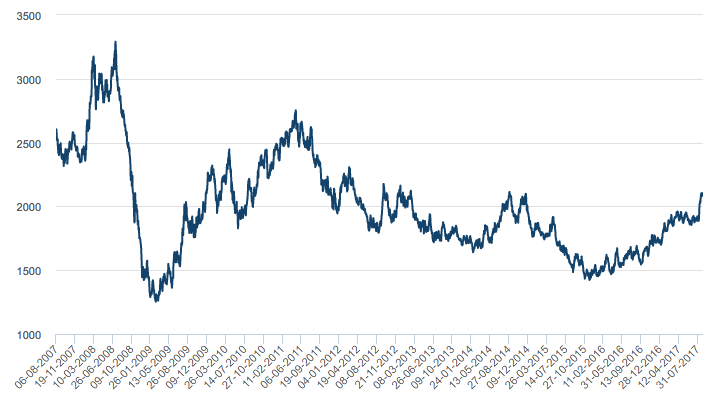 10-year aluminium chart: Breaking out at last? Steve Johnson, CIO at Forager Funds still sees value in the mining services space. He focused on the quality management in his stock pick, MacMahon (MAH) making the point that while everyone wants to buy a great management team, the challenge is to invest in one at less than the market is valuing it at. Martin Conlon snuck in a second stock idea from the small end of the market, $134 mil market cap 3P Learning, which provides online educational programs to schools and parents. 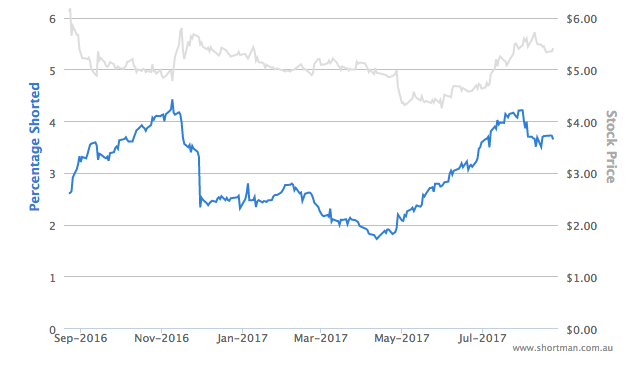 The slowly stock fell 60% after its IPO in 2014, but has made up some ground since 2016. It slipped ahead of reporting season on low volume, but has stabilised since. “It’s got the makings of a really interesting business in technology, which is an area of froth and bubble, but the stock is a long way from froth and bubble in its valuation”. While Martin discussed both Alumina and 3PL, he had to settle on just one of them, and ultimately it was 3PL that he nominated. If you are not already a subscriber to Livewire, join the +70,000 investors using the site, and also receive 'Trending on Livewire' each morning for free, by subscribing here.